Professor Helen Skouteris is a developmental psychologist and expert in health behaviour change and women’s and children’s health, especially in relation to obesity prevention. Professor Skouteris works in implementation research and evaluation projects focused on improving health and developmental outcomes for women, children and adolescents. Her current research is around building active capacity in ‘the consumer’ to make healthy lifestyle choices across preconception, pregnancy, preschool, and childhood, including adolescence, to reduce the burden of obesity. Her work has also been focused extensively in community service and educational sector improvement – research that is critical to transforming policy across these sectors and translating to better health outcomes for children, young people, adults and families. When Professor Helen Skouteris became clinically obese during one of her pregnancies, gaining 32 kg, she says her excessive weight gain between obstetric visits was not considered to be an issue. We now know that excessive pregnancy weight gain is experienced by the majority of Australian women and is associated with poorer health outcomes for the mother and child, including greater risk of maternal and childhood obesity. Tackling maternal obesity by empowering women to take charge of their own health is now the focus of her research at the Prevention Centre. Professor Skouteris, a developmental psychologist and Professor in healthcare improvement and implementation science at Monash University, is best known for her pioneering work over the past two decades on body image during pregnancy. She has demonstrated that combatting maternal and childhood obesity requires a systems approach. “Getting it right for women in terms of healthy lifestyle behaviours before conception and during pregnancy, and then supporting them and their families in the postpartum, is crucial to reversing the intergenerational cycle of poor health,” she says. This would reduce not only the prevalence of maternal and childhood obesity but also associated morbidity in later life, such as cardiovascular disease, diabetes, cancers and chronic diseases directly related to poor lifestyle. “Obesity in pregnancy has been shown to be associated with negative body image, stress, depression and anxiety,” she adds. The complex issue of maternal obesity, therefore, needs to be addressed collaboratively and collectively, she says, a lesson she learned during a National Health and Medical Research Council Project Grant she led in 2011. Despite good intentions to evaluate an intervention to prevent excessive pregnancy weight gain, she says her research failed to do so. Professor Skouteris attributes this to the fact that her research was largely designed by behavioural psychologists, without engaging other multidisciplinary stakeholders and end users – pregnant women. As a result, in 2013 Professor Skouteris organised a national forum to develop an alliance around health in preconception and pregnancy, inviting 60 experts from across Australia to come together to discuss the issue of maternal obesity and how we can prevent it. At this forum she also met Professor Helena Teede, Director of the Monash Centre for Health Research and Implementation. “We formed an immediate affiliation; we were both on the same page, and we started working together on our large program of research to prevent maternal obesity from a lifespan perspective across preconception, pregnancy and the postpartum,” she says. 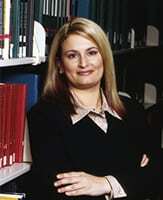 Professor Skouteris has since joined Professor Teede at Monash where she is today. In her spare time, Professor Skouteris is a soccer supporter and former player. She is Vice President of the Caulfield Cobras Football Club and the female football coordinator. Back in her twenties, she captained an amateur team, years before women’s football became mainstream. “I’ve always wanted to promote women and girls in sport because we know that they are more likely to drop out of physical activity and sport at the time of adolescence. And we know this lack of physical activity has health implications for young women, especially as they move into their reproductive adult years,” she says.